The Internet is overloaded with content. The problem is not finding information – it’s about finding the right information. Search and different methods of filtering have become more important today than ever before, because of this information overload. You may be familiar with standard Twitter Search, but if you want some deeper searching power, try usingAdvanced Twitter Search. 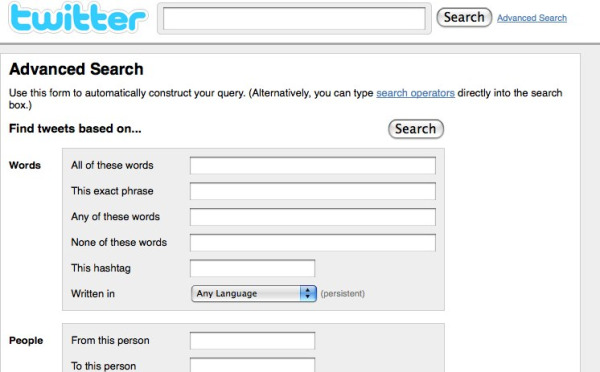 With advanced search, users have an entire page of operators. 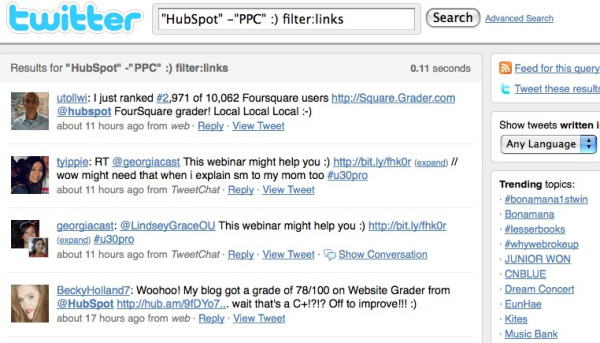 For example, you can look for tweets containing a keyword that were sent by a particular user. If you run a local business, you can search for tweets near a specific location. Both of these tasks could help provide a targeted and relevant list of people to follow on Twitter. When looking for only a specific phrase of words on Twitter, use exact match. This can be done in advanced search or by including quotes around your search phrase "sample search phrase". This is often important for long search phrases that can return many irrelevant results due to pulling results for each individual word in the phrase. Even using exact match, the results you find may not be clear enough. Often business that you are searching for may share names with other organizations or products. The best way to solve this problem is to remove keywords related to the irrelevant results. This is done by placing a minus sign in front of the words you want removed from inclusion in the results. For example, let’s say you are looking for tweets mentioning Bayer, but you only want tweets from their Crop Science Division. 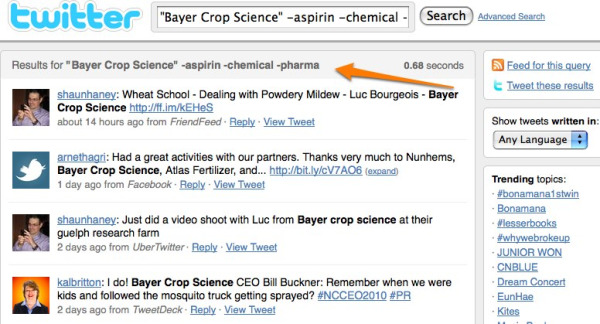 Your search box may look something like this: "Bayer Crop Science" -aspirin -chemical -pharma. As marketers, a common question that gets asked is sentiment. Do people like our company? Twitter can help answer this question. Twitter allows you to search for positive and negative search results. This might not be the level of detail some marketers are looking for, but it is a start. Search for sentiment is simple by including a ":)" for positive and ":(" for negative. Example: For negative tweets about your competitor enter: "competitor name"
One problem with Twitter search results is that many of us want to see the data and information over time, instead of only the couple of minutes after we search for it. Twitter make it easy to do this by providing RSS feed for search results pages. In the right side bar of the results page, click the "feed for this query" link and then add that feed to an RSS reader and you can easily track specific search results over time.